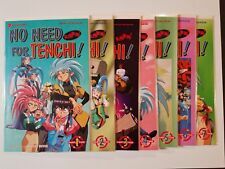 NO NEED For TENCHI! Part.2 #1-7 NM Run (Viz Select,1994) Ryoko Hitoshi Okudai! No Need for Tenchi! Part 12 #3 2001 NEW! This page was last updated: 20-Apr 07:36. Number of bids and bid amounts may be slightly out of date. See each listing for international shipping options and costs.